Tetlow King Planning (TKP) assisted St Modwen in achieving planning permission for a major mixed-use development on a former engineering resources depot to the south of Stratford-upon-Avon, now known as Meon Vale. The development comprised up to 550 dwellings, including the potential for up to 85 extra care units, a leisure village and various commercial development. This adds to an existing permission granted; which inter alia includes 500 dwellings. The total effect of these and other permissions in the locality will be the creation a new village of over 1000 dwellings encompassing a comprehensive range of house types and community facilities. Over 350 of these dwellings will comprise affordable housing. TKP were engaged to assist St Modwen in articulating the specialist affordable housing and extra care aspects of the latest planning application; including the preparation of supporting statements to the planning application, liaison with the Council’s housing officers and negotiation of the relevant terms of the Section 106 Agreement. 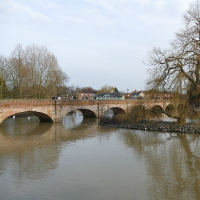 TKP were also instructed to make relevant representations on the emerging Stratford-on-Avon Local Plan. Robin Tetlow, Chairman, subsequently appeared at the Public Examination. After extensive negotiations between St Modwen and Stratford-on-Avon District Council spanning many months, the Council was eventually persuaded to grant planning permission. This was despite third party objections that the proposals were neither ‘sustainable’ nor in accordance with the Council‘s adopted and emerging development plans. The Council ultimately decided that the benefits of the proposed development, specifically including the affordable housing and extra care housing elements, outweighed any planning harm. TKP collaborated within a wider professional team acting for St Modwen on this case. Inter alia Barton Willmore acted as lead planning consultants; Martin Kingston QC provided strategic legal advice; and Irwin Mitchell acted as Solicitors.